Staying distracted and busy is the goal for today. That’s what happens when you’ve been hit with a nasty Norovirus and you have to miss your best friend’s baby shower. I am so unhappy about that. Not only did I miss out on cake and fun and seeing Susan in all her giant belly glory, I missed seeing a whole lotta other friends I’ve been missing. I guess I can take solace in the fact that the puking/diarrhea/fever train seems to have left the station. Now it’s just lingering hot flashes, dizziness, sensitive stomach. I can function, but who knows how contagious I might still be? Maddie had the crud, too. It’s possible she gave it to me when we met at The Alley Light last Sunday for dinner with our old friend Kim. Or maybe I gave it to her. Either way. Since the miserable sickness seems to be on its way out I can finally move around and eat, and sew. Because what else do you focus on when you’re wallowing in shower-missing sadness? I re-threaded my serger, figuring I need to practice with it if I’m going to get serious about sewing apparel for myself. As much as I’ve enjoyed making things I’d still put my skill level at novice. There’s a lot I need to learn about finishing techniques. And putting together-y techniques. I think my biggest obstacle is a total lack of decent fabric sources locally. I’d have to trek out to Richmond (okay, that’s not terrible, but I AM pretty lazy). Ordering online means taking a gamble if you’re not completely sure what you’re looking at. 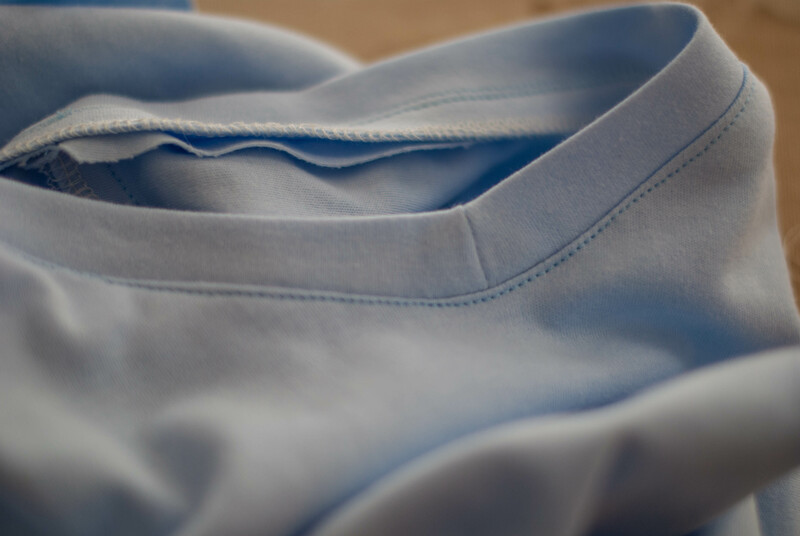 And trust me, good fabric makes aaaalllllll the difference. 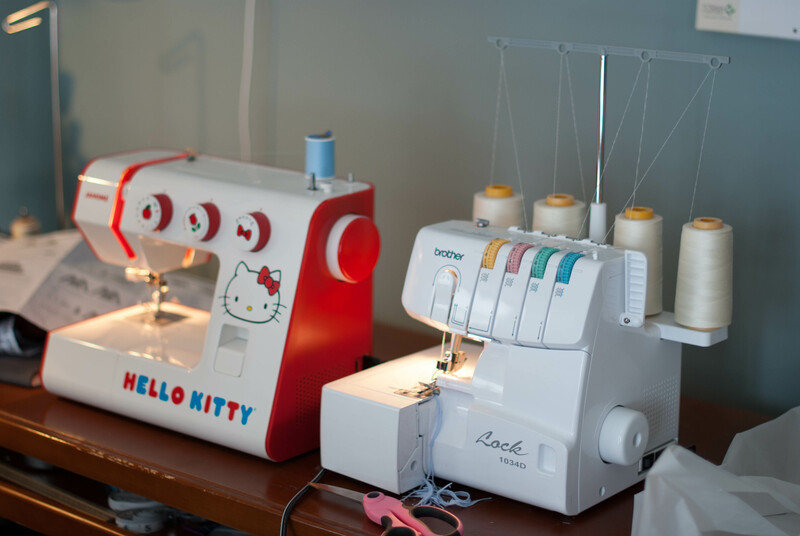 Especially if you’re sewing with standard-issue machines, as I am. Anyway, I worked on a three-quarter sleeve tee shirt today. 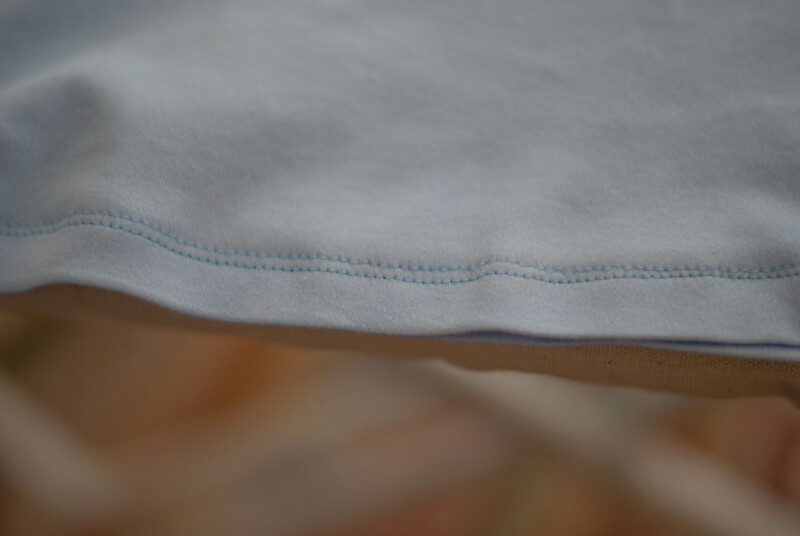 I’m loving the clean edges with the serger. Unfortunately I can’t use it exclusively to sew the pieces together since I seem to be having a lot of tension issues with it. Maybe because I’ve got the cheapest serger on the market. I love this Renfew shirt pattern from Sewaholic for its ease of use and how simple the dang neckline is! I’m pretty happy with how well it turned out, even though my stitching could be better. I thought for sure when I sat down today that I had a twin needle to work the hemlines, and as it turns out, I don’t. 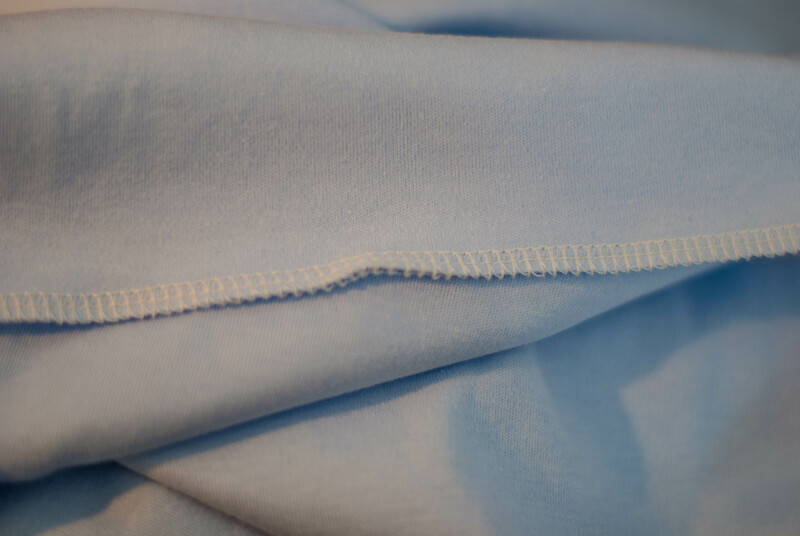 So…….I sewed one line, moved the fabric, and tried to make the next line as parallel as possible. It’s not bad, but it’s not fabulous, either. See? 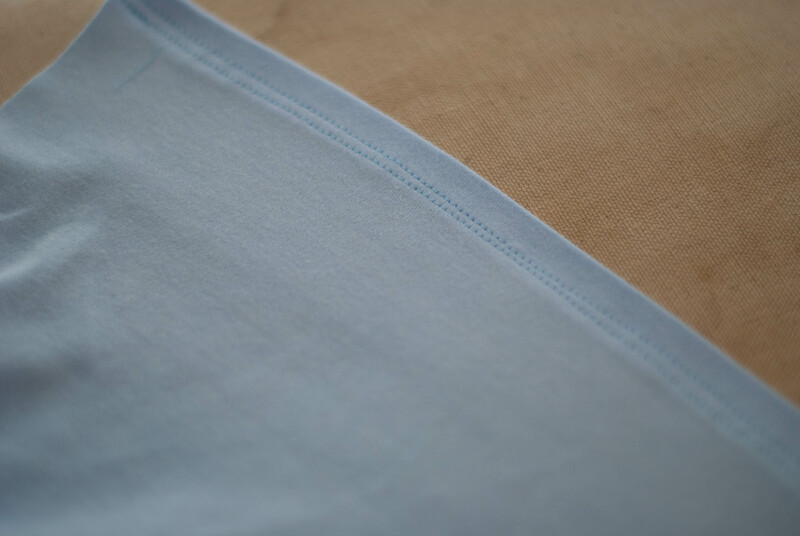 This is the sleeve hem. Not bad, not great. (I did order a twin needle. It’s coming next week). The one issue I have with the pattern is the banded bottom hem. 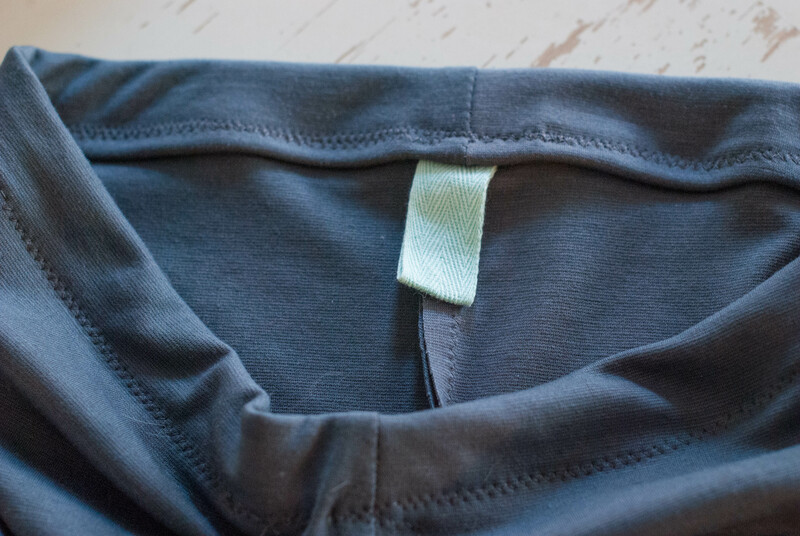 I want just a simple, regular ol’ tee-shirt hem. Again, no twin needle. What I’ve ended up with is a hem that doesn’t look terrible, but there’s a stretch issue now that’s making it kind of ripply and weird. I’ll be revisiting the hem on this when the twin needle (and more stabilizer tape) arrives. I did have a lot of success with Cake Pattern’s Espresso Leggings. 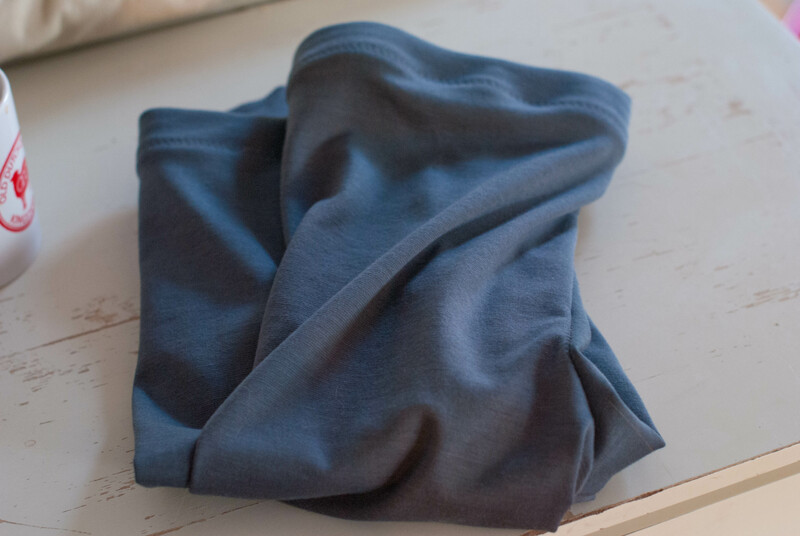 They were super easy to assemble and I had fabric already that I knew would be perfect for leggings (just a standard Ponte de Roma knit from fabric.com). I love that they have you put a looped ribbon in the back so you know which side is which. It looks a little more polished somehow! They went together in less than an hour and fit perfectly. No, you will get no pictures of them on me today, due to the previously mentioned illness. I’m not looking my best right now! Next I think I want to try Papercut Pattern’s Ooh La La Leggins. They have more visual interest and look challenging in a very fun way. Also, I should mention that THIS BOOK has helped me tons. It’s a great reference for sewing knits, and I need all the help I can get! If you’re new at sewing knits or, like me, need extra help, I seriously can’t recommend it enough!